We recommend that Advanced students follow the Internacia Perfektiga Koresponda Kurso. It is suitable for those who have completed the Elementary..! course, or for those who have reached an equivalent standard of learning by other methods. It assumes a knowledge of foundation grammar and basic vocabulary, so this course is not suitable for absolute beginners. You will be applying, practising and developing your knowledge of Esperanto grammar through reading, answering open-ended comprehension exercises and creative writing. The exercises will help to build your confidence in the advanced application of grammar and style. You choose how much or how little to write for your answers, and the course is very student-friendly; you may complete a whole lesson before submitting your answers or may send a few exercises at a time, if you prefer. There are twenty-six lessons, which take you through the simulated life of an Esperanto Club; you 'participate' in lectures and readings, poems and discussions, and so learn about Esperanto literature, history and culture. This affords excellent preparation for the international exams. Each lesson includes explanations (where necessary), abundant exercises and a 'culture quiz'. The tutor for this course is its author Boris Kolker, a renowned Russian Esperantist and a member of the Academy of Esperanto. He will monitor your progress by checking your answers, highlighting and explaining any areas that you have misunderstood, and answer questions or queries that you may have as you learn the language. Tuition is normally delivered by e-mail, although postal delivery is possible (at a higher cost) if preferred. All students following the course are put in touch with others, and so belong to an international support 'club'. If you wish, you can click here to see some sample lessons. Course Tuition is available by e-mail or (at a higher price) post; for the latter you'll also have to pay postage to send your answers to Boris Kolker (who now lives in the USA). [See price and order online]. 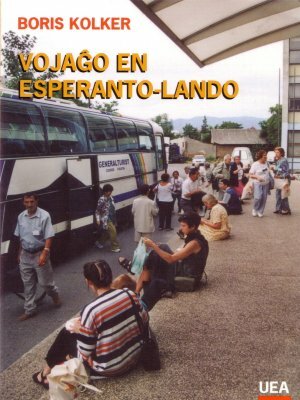 The course textbook Vojaĝo en Esperanto-Lando is necessary for postal tuition, and optional (but strongly recommended) for e-mail tuition, because it gives you a printed copy of the texts with illustrations and proper accents. [See price and order online]. You will also need a good, advanced-level Esperanto dictionary. We recommend the Plena Vortaro, or the Nova Plena Ilustrita Vortaro [See price and order online]. Reminder: This course assumes that you have a reasonable basic vocabulary and a knowledge of foundation grammar: All material, instruction and tuition are in Esperanto. It is not suitable for absolute beginners. We also recommend these two books by Bill Auld: Paŝoj al Plena Posedo [see price and order online]. for those who wish to perfect their translation skills.